Spring is a welcoming time of renewal, and what better way to welcome friends and family to your home than with a creative and personal spring wreath! Even better when you can make it for under $5! (Except for the succulent wreath!) We have basic instructions for making a spring wreath that can be adapted to your project, and also some of our favorite bloggers projects with tutorials! 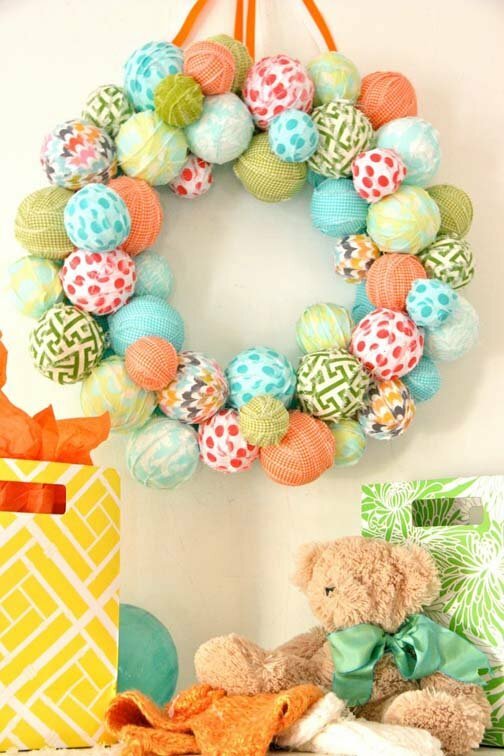 Our featured project, above, is a DIY spring wreath made by A Soft Place to Land, and they have step by step photos for this incredible wreath made from gran and scrapbook paper! Choose a theme for your wreath. I used inspirational quotes as mine, but you could use gardening, Easter, sewing, children, nature, birds, dogs,tea party…the list is endless, use your imagination! Pick up supplies at your local dollar shop or discount store. You’ll need a grapevine or straw wreath base, a roll of ribbon, and various little decorative items. 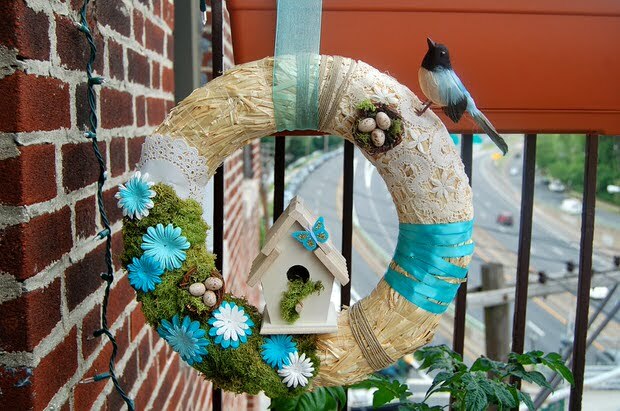 Decorative items need to be small so they can be wired or glued easily to the wreath base. I searched the scrapbooking section for some terrific themed items! Most craft stores have a “wood” aisle where they sell lots of wooden cutouts in various themes for as low as a quarter a piece. Wrap your wreath with ribbon, or add a bow if you prefer, and then tie in the back or use a glue gun to secure. Next lay out your items on the wreath until you find a pleasing composition…it often looks best for things not to line up perfectly. Now add your focal items. You can either use floral wire, or do like I do and strip the paper from those twisty ties that come with your bread. Fill in with colorful background players…since mine was a springtime wreath about inspiration, I used birds and butterflies! 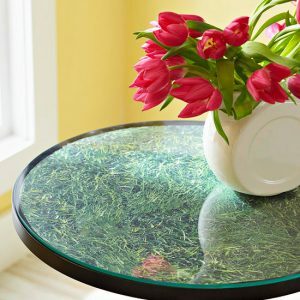 Finally, tuck in a few floral picks to add that springtime style! No need to go buy expensive bunches, I just snipped these from some silk branches I already owned. You can also pick up little floral picks from the craft store. 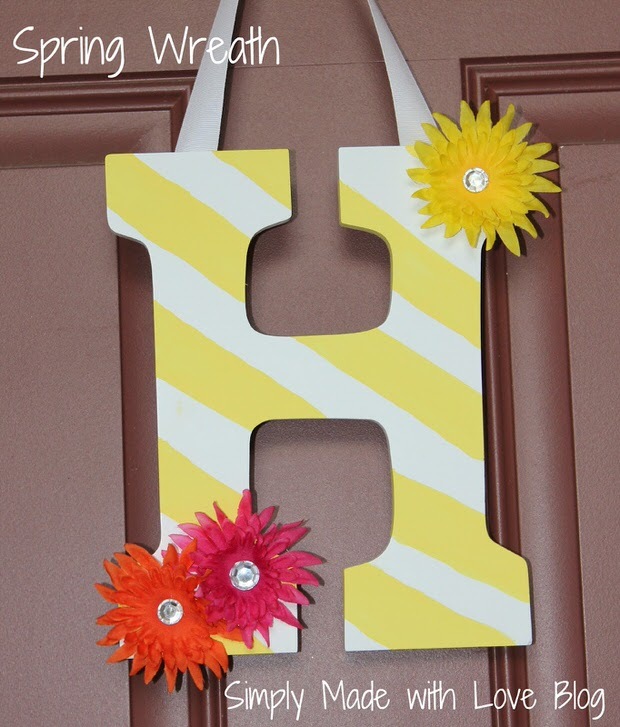 Voila!…easy, quick, and it may not be expensive, but it has so much personality, no one will notice! Don’t overlook using those dollar shop wreaths on their own, tucked into bookshelves, leaned against mantels, or hanging as grouping on the wall. 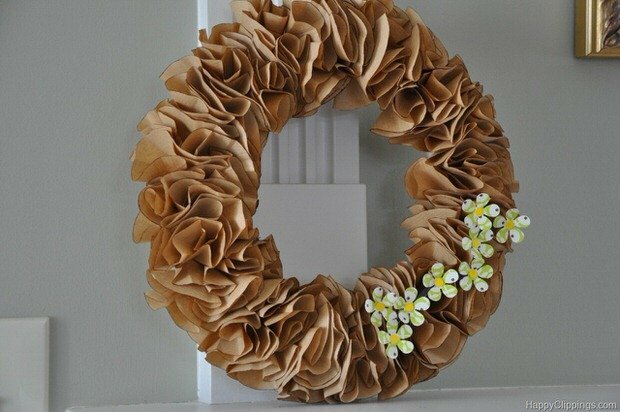 Welcome Spring into your home with a handmade wreath that is an expression of you and your family. (And all it took was a quick trip to the dollar shop and the craft store, and a measly $5!) Now check out these great projects! 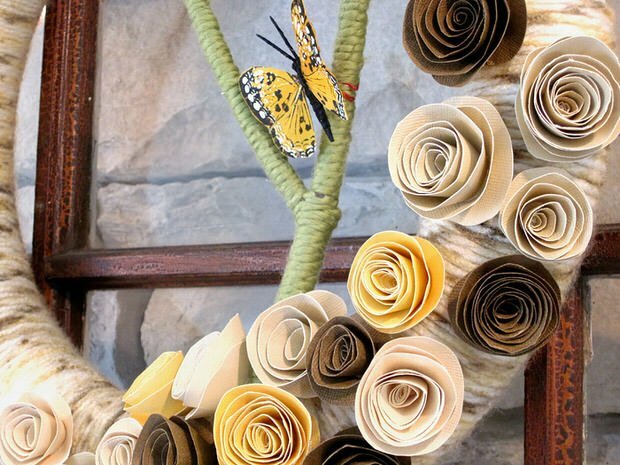 Happy Clippings made this incredible paper spring wreath! Some of her readers talk about making it with old book pages… I think that could make a great conversation piece. Oh My Gracious made this very inexpensive DIY spring wreath from a straw base and some ribbon, flowers and moss. So cute! 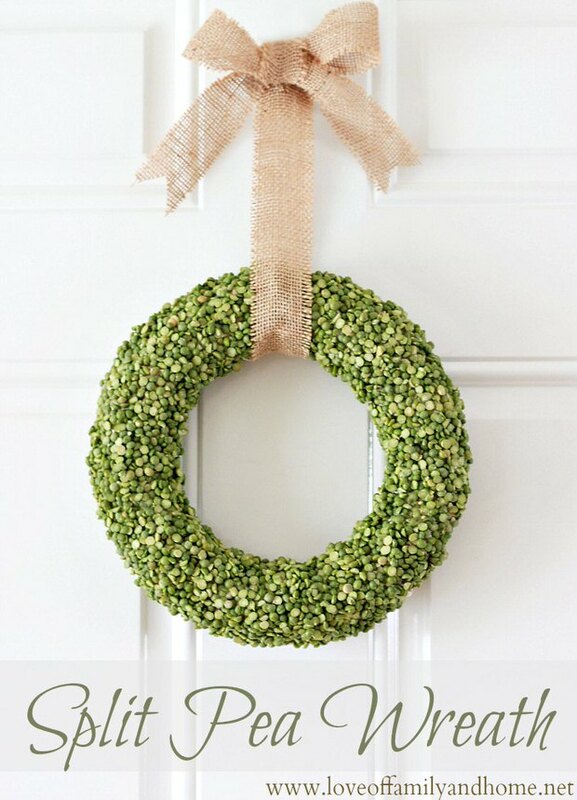 Love of Family and Home shows you how to make this really organic looking DIY split pea wreath. I really love it when bloggers take an inexpensive idea and makes it look really stylish. Love blue? 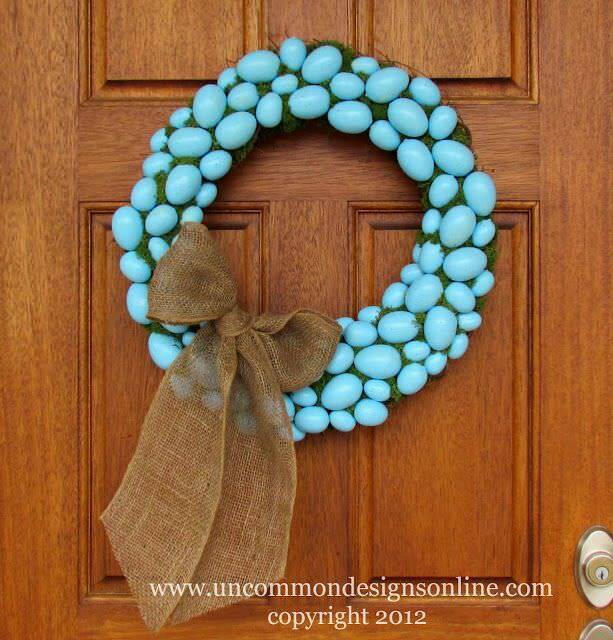 This robins egg wreath tutorial by Uncommon Designs is easy and amazing! Marie at Blooming Homestead has a total tutorial (even a video!) 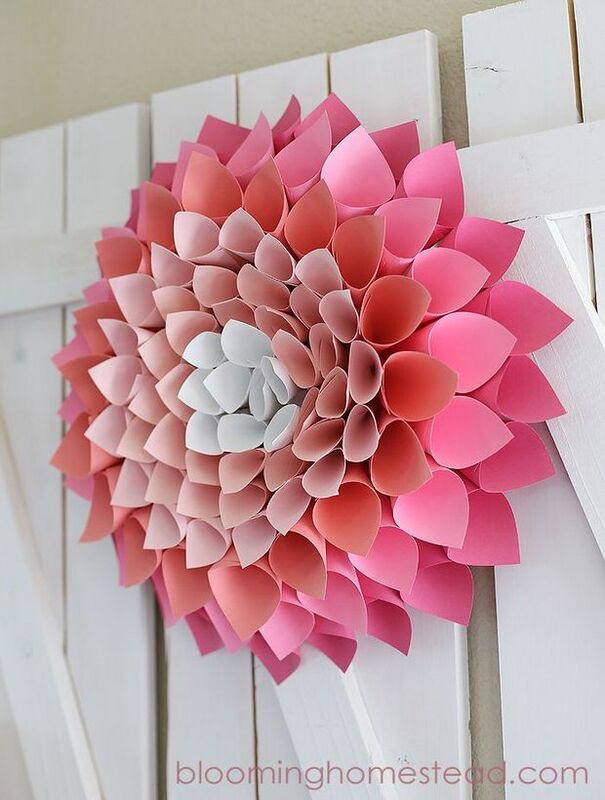 on making this DIY spring wreath from paper! Oh my goodness this is wonderful!